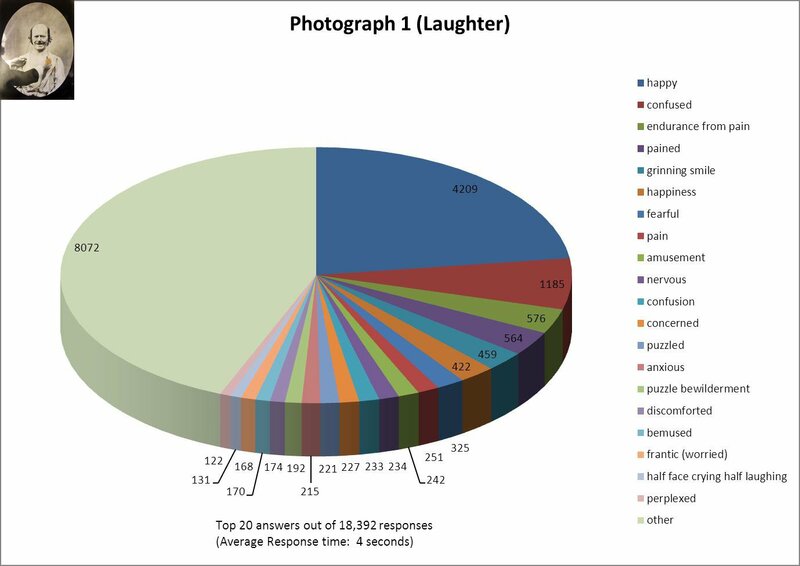 Thanks to all who took part in our online emotions experiment – over 18,000 of you! The formal stage of the experiment is now over, but it will be staying online as an activity, so if you don’t want to know the results, look away now. If you’d like to find out more about the experiment, or have a go yourself, click here. We promised to give some feedback and so here is what we made of the results. 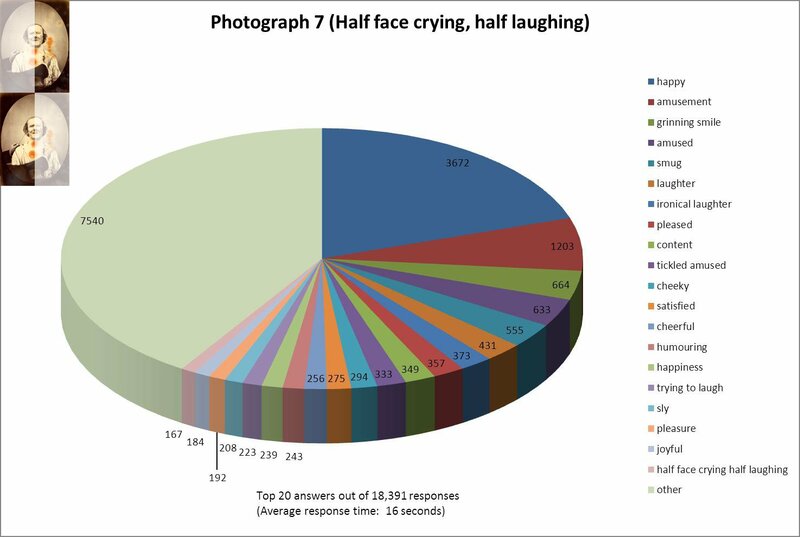 We’ve summarised the top 20 responses to each photograph in the pie charts below. We have left related words in the survey, so as not to put our own interpretations on what constitutes a similar enough word to be grouped together into the same emotion. 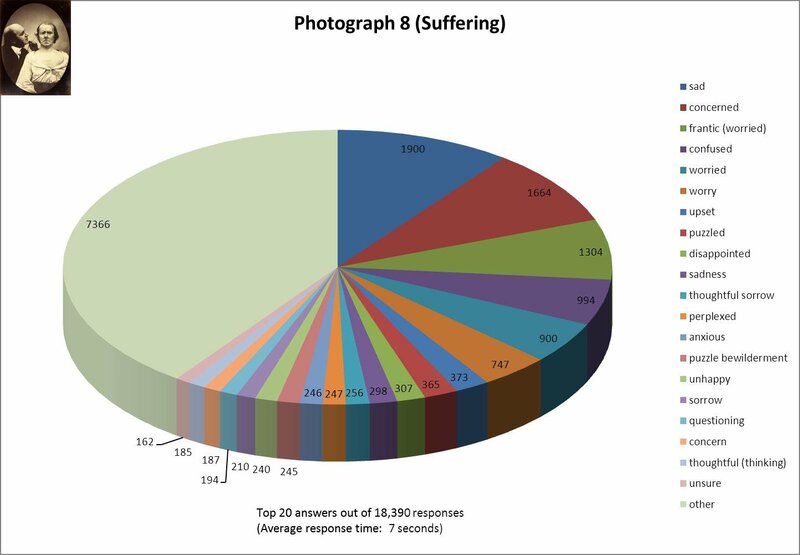 Your responses to each of the Duchenne photographs were processed in exactly the same way but, as with Darwin’s original experiment with colleagues, friends and family members in March to November 1868, the experiment is hardly scientific by modern standards. We did however have a much larger number and broader range of test subjects than Darwin. Darwin only tested 23 English men, women and children of different ages and, although completely anonymous, we are assuming that our responses came from all over the world. Though Darwin’s subjects were all middle class Victorians, they probably found it easier to identify these highly stylised depictions from their experiences of Victorian theatre. For us, the interest in the experiment was not so much in the results as in the process of taking part, and in learning more about the context of Darwin’s studies of expression and the methodological problems he faced. The main aim was to give a sense of what it was like to participate in an experiment in Darwin’s day. What we can say is that the responses to each photograph were extremely diverse. 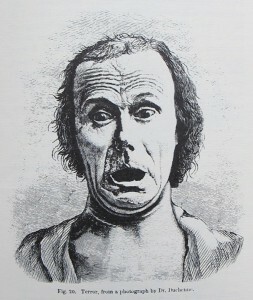 This reflects Darwin’s conclusion that some of these artificially-created facial expressions convey a particular emotion more convincingly than others. 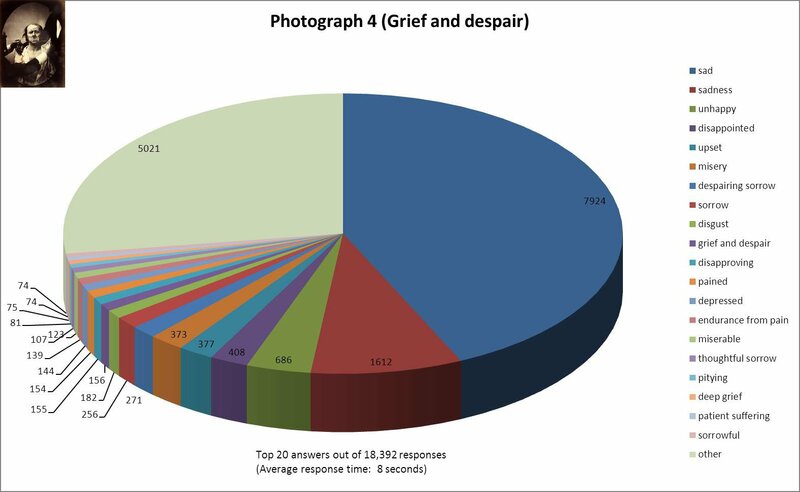 For instance, over 50% identified photographs 2 (surprise), 3 (terror), 4 (grief and despair) with the correct or very similar emotion, and over 25% of you identified photograph 1 (laughing) with a happy-type of emotion. 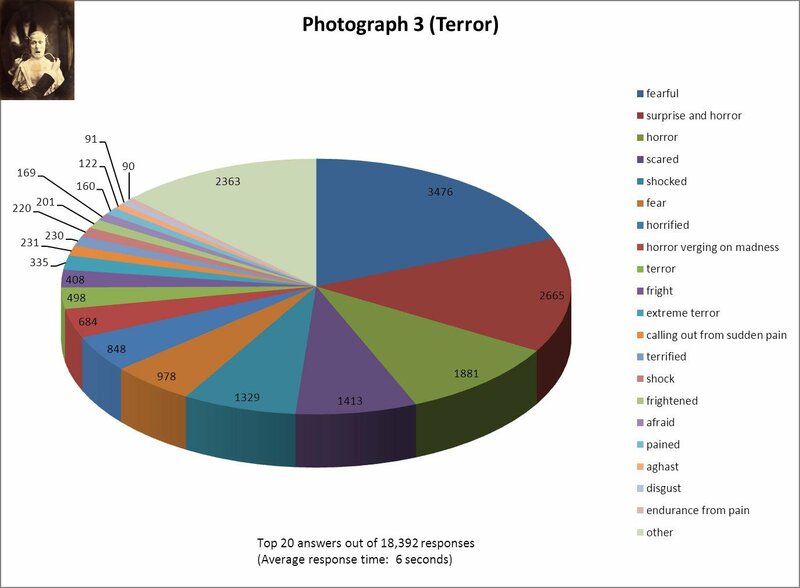 Click on the pie charts to see larger versions. However, for the perhaps more complex emotions depicted in photographs 5 to 11, hardly any of the participants identified the exact emotion and there was a greater range of, often conflicting, interpretations. This was true of Darwin’s subjects as well. Clearly some of the top answers are words that have some relation to the intended emotion but the level of disagreement is much more marked. 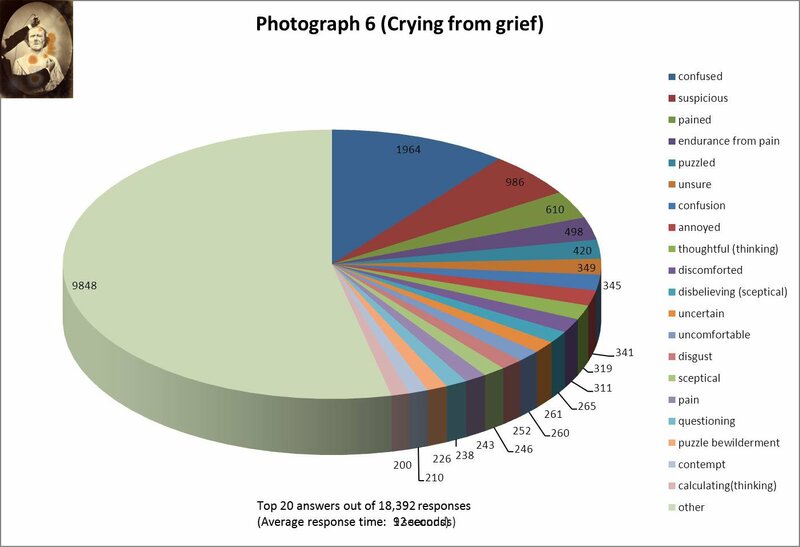 This is especially apparent with photographs 6 (crying from grief), 8 (suffering), 9 (deep grief) and 11 (hardness) where the proportion of ‘other’ responses is between 40% and 60% of the total. 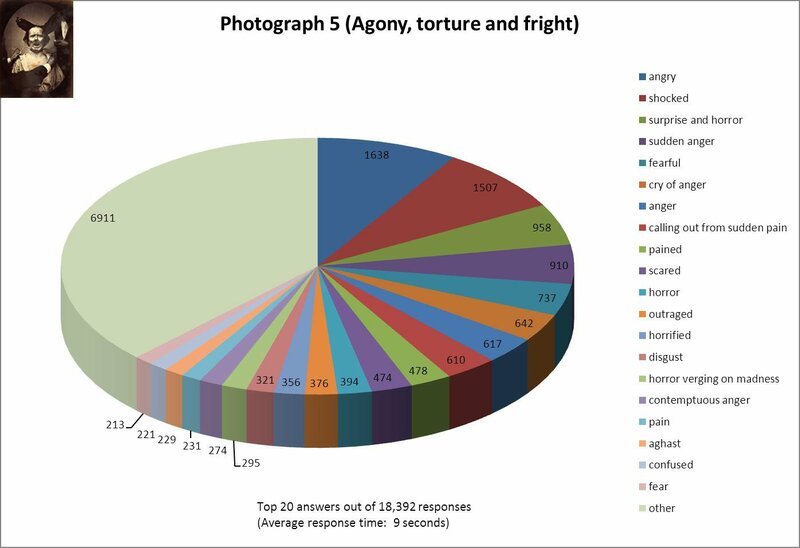 With photographs 5 (agony, torture and fright) and 10 (fright with agony) there is a broad level of agreement on the general type of emotion and, equally, with photograph 7 (half face crying, half laughing) people were generally half right in identifying the face as depicting a happy-type emotion. Click on the pie charts to see larger versions. 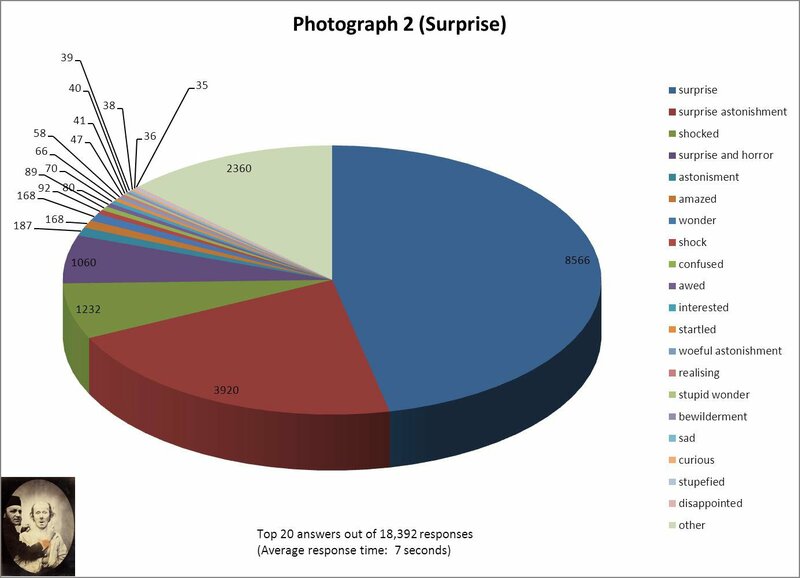 The average response times ranged from 4 to 16 seconds, indicating that people did not think about the photographs for a long time. This is broadly in keeping with Darwin’s conclusion that ‘many shades of expression are instantly recognised without any conscious process of analysis on our part’ (Expression, p. 360). 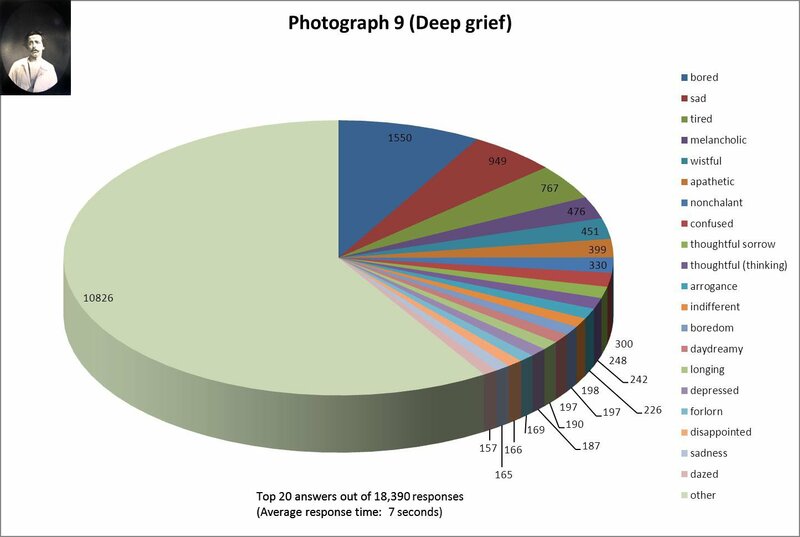 People looked at the compound emotions for the longest time on average (e.g. half face crying, half laughing -16 seconds; crying from grief – 12 seconds; grief and despair – 8 seconds) before making a decision. 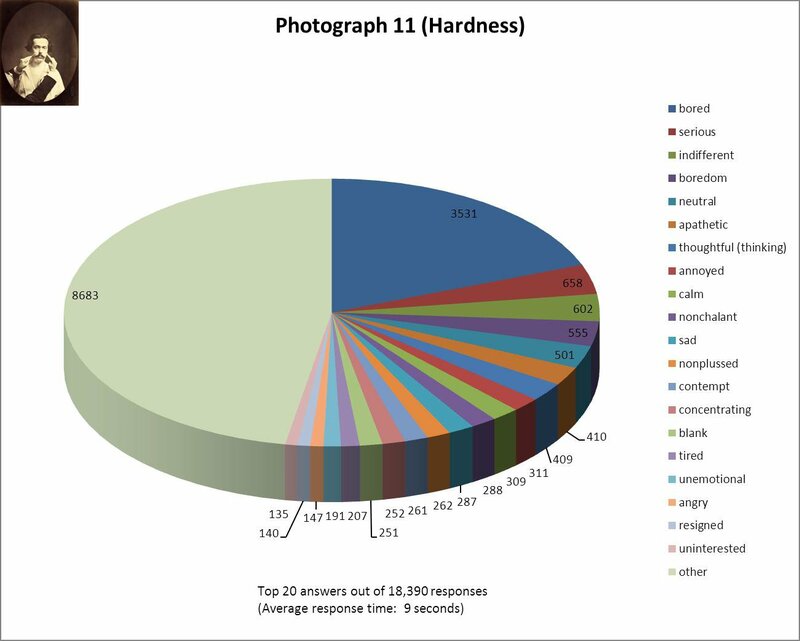 They also looked at photograph 11 (hardness) for 9 seconds, possibly because this would no longer be identified as an emotion. 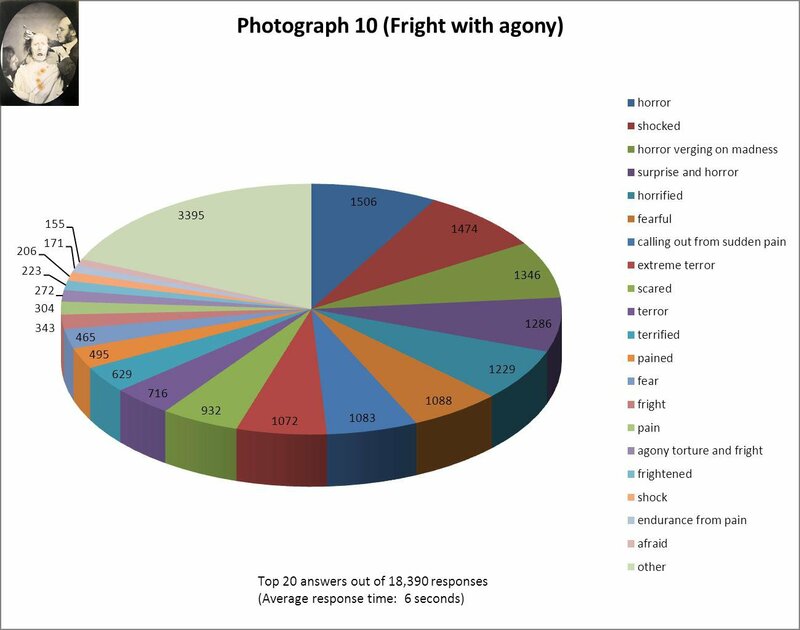 This illustrates the point that the repertoire of emotions may change over time in different historical contexts; as does the top response to photograph 9 ‘bored’, which is unlikely to have been seen as an emotion in Victorian times. Darwin was surprisingly inventive in developing this and other methods (like the questionnaire) and the experiment was innovative for its time. He was self-critical, revising his methods as he went along, and doubtful about what his results could show. Some uncertainty remains today, especially questions about the ability of language to describe emotions, and problems with synonymy and the categorisation of emotions. Finally, the experiment shows how difficult it is to identify emotions from static images, which is why modern experiments use video to show more context (such as tone of voice and body posture) and change in expressions over time. You can find the experiment, background context and Darwin’s results here.